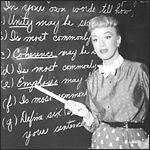 Eve Arden portrays Miss Connie Brooks, an overworked and underpaid teacher of 10th grade English at Madison High School. Our Miss Brooks called her radio classroom to order beginning July 19, 1948. Gale Gordon co-starred as the school's blustery principal Osgood Conklin, Richard Crena portrayed the adenoidal Walter Denton and Jeff Chandler starred as the shy biology teacher who Connie hoped to teach about the birds and the bees. The final bell rang for Our Miss Brooks on July 7, 1957. (3/27/1949) DOES CLAY HIGH WANT MISS BROOKS? (5/29/1949) WHY IS EVERYBODY ARGUING? (7/31/1949) WILL MISS BROOKS RESIGN? (1/15/1950) CURE THAT HABIT, INC.